Here are the 10 Clinton County winners in the 2018 Recycled Christmas Ornament Contest. 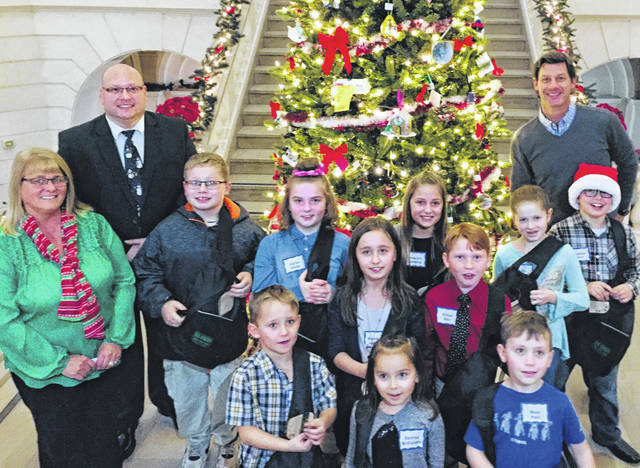 The winners, and their respective grades and schools, are: Jaylee Hicks, 5th, Wilmington Christian Academy; Jocelyn Lansing, 5th, Blanchester Intermediate; Lily Rice, 4th, Blanchester Intermediate; Braxton Short, 3rd, Putman Elementary; Mikey Willhite, 3rd, Denver Place Elementary; Ethan Kau, 3rd, Clinton-Massie Elementary; Brooklyn Jones, 2nd, Putman Elementary; Aiden Reeves-Cain, 1st, Holmes Elementary; Mesa Prell, 1st, Connections Academy; and Korynn McFadden, kindergarten, Wilmington Christian Academy. Also pictured are, from left, Clinton County Commissioner Brenda Woods, Clinton County Solid Waste Management District Coordinator Jeff Walls, and Clinton County Commissioner Kerry Steed. WILMINGTON — This year’s Recycled Christmas Ornament Contest received entries from a record-setting 94 homeroom classes in grades K-5 across Clinton County. Participants were asked to create ornaments using recyclable or reusable materials. During Tuesday night’s awards ceremony, Clinton County Commissioners Brenda K. Woods and Kerry R. Steed along with Clinton County Solid Waste Management District Coordinator Jeffrey D. Walls, recognized the 10 county winners as they placed their ornaments on the courthouse Christmas tree located on the stairway landing. Following are the 10 county winners, along with their respective grades and schools: Jaylee Hicks, 5th, Wilmington Christian Academy; Jocelyn Lansing, 5th, Blanchester Intermediate; Lily Rice, 4th, Blanchester Intermediate; Braxton Short, 3rd, Putman Elementary; Mikey Willhite, 3rd, Denver Place Elementary; Ethan Kau, 3rd, Clinton-Massie Elementary; Brooklyn Jones, 2nd, Putman Elementary; Aiden Reeves-Cain, 1st, Holmes Elementary; Mesa Prell, 1st, Connections Academy; and Korynn McFadden, kindergarten, Wilmington Christian Academy. Ornaments representing the 94 homeroom classes will remain on display at the Clinton County Courthouse through the Christmas holiday, and will be returned to each student following their school’s winter break. The 2018 Recycled Christmas Ornament Contest was sponsored by the Clinton County Solid Waste Management District.